So, we've had Contraltos that can play the piano, and one that can even play the trumpet. But a Bassoon playing Contralto? Surely not! Well there is one, and her name is Nathalie Stutzmann. Apart from the usual Contralto repertoire, she is an excellent interpreter of French chanson and German lieder. She also conducts her own string quartet. How's that for multi-talented? Nathalie Stutzmann is considered to be one of the most outstanding musical personalities of our time as well as one of the rare genuine contraltos. As part of her exclusive contract with Deutsche Grammophon as a conductor and singer, she released a first recording in April 2011 dedicated to the great Vivaldi contraltos under the title "Prima Donna". 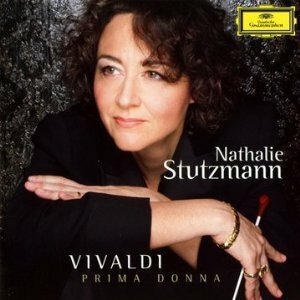 Nathalie Stutzmann works regularly with the greatest conductors, and has appeared with some of the most prestigious orchestras including the Berliner Philharmoniker, the Wiener Philharmoniker, the Orchestre de Paris and the London Symphony Orchestra. A typical example of the complete musician, Nathalie Stutzmann began studying piano, bassoon, chamber music and conducting while at an early age. In parallel with her many appearances as a singer, she now devotes a large part of her season to her work as an orchestra-conductor, and two exceptional maestros have taken her under their wings to accompany Nathalie in her projects involving the symphonic repertoire: Jorma Panula, a legendary teacher, and Seiji Ozawa, whose complicity with her dates from the beginning. In 2009 Nathalie Stutzmann founded her own chamber orchestra, Orfeo 55, an ensemble whose performances not only feature baroque instruments, but which allows her to explore a broadly varied repertoire. Her experience as a Romantic musician and her knowledge of early musicstyles enable her to take on a wide range of works by composers from Vivaldi and Mozart to Beethoven, Wagner or Brahms. Her approach – at once free and rigorous –, her knowledge of phrasing, the emotional intensity of her performances, and her exceptional mastery of the passion she communicates, are as many elements which have led Nathalie to be appreciated by audiences as much as by the orchestras she has conducted. The Orfeo 55 orchestra under Nathalie Stutzmann is in residency at the Metz Arsenal. Nathalie is also Associate Artist with the Singer-Polignac Foundation. Decorated "Chevalier des Arts et Lettres" and "Chevalier de l’Ordre National du Mérite" by the French State, Nathalie Stutzmann also teaches performance classes throughout the world, and is a teacher at Geneva's Haute Ecole de Musique.